"Why don't people make candles with scents that everyone likes?" 15-year-old Hart Main asked, sniffing at the overly perfumed candles his sister was selling for a school fundraiser. Recognizing the opportunity right under his nose, the young entrepreneur combined his passion for helping his community with his interest in making a bolder breed of candle by donating to local soup kitchens and using the empty cans to hold his extraordinary scents. Hart and his family collaborate with local chandlers to craft soy-wax-blend candles that possess the kinds of familiar aromas that no man (or woman) would turn their nose up at. Hart's current lineup includes natural, nostalgic and savory scents like dirt, fresh cut grass, sawdust, campfire, pizza, and coffee. Each comes individually packed in a gift box. Handmade in Ohio. The wax is a 100% renewable resource, a soy and vegetable wax blend. 3.5" H x 2" Dia. Candle will get very hot while burning, do not touch can while lit. Keep away from flammable materials, never leave burning candle unattended. Each candle has a wax color unique to its corresponding scent. New York Style Pizza has red wax, Fresh Cut Grass has dark green wax; Dirt, Coffee, Sawdust, and Campfire have tan wax. Please note: because of the use of natural ingredients such as soy wax and coconut oil, during the summer months, these candles can get warm in transit and the wax may become very soft or in some cases may melt. In most cases, you should be able to put the candles into the fridge or freezer and still be able to use them. Please keep in mind that if you put them on the radiator or in direct sunlight the wax could become very soft. Please store in a cool place when not in use. 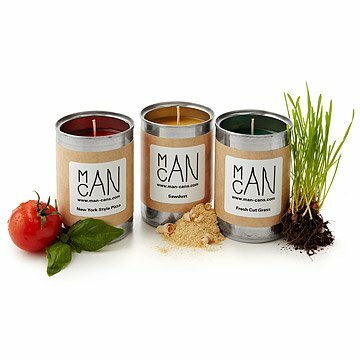 Man Candles - Original have been discontinued. When they sell out, they will no longer be available. I bought the pizza candle for my son's 17th birthday. I thought it was a very cool idea, and couldn't wait for him to open it. Imagine our horror when the candle smelled not like pizza, but like toes. Burning it did not produce a pleasant pizza aroma either. I would buy 20 more of these! I gave this to my son for a gift and he doesn't get too excited about a candle, but said this one smells so great and he would "buy 20 more"! So, success, giving one of these for a gift or yourself! I had expected the candles to smell as much like dirt and real cut grass as possible. The dirt candle was barely recognizable and the grass candle smelled like chemicals and we would not have been able to tell what it was supposed to be without the label on the box. I was a bit disappointed. Scents were fine, packaging not so. Scents were as advertised. Cans arrived bent, but still stood up straight and were safe to use. One of the two cans did not have a label, which was annoying also, but did not affect the use. We ordered this as a gift - the candle came smaller than what we were expecting. We didn't read anything about the size of the candle before purchasing though. But it is smaller than your average can. We bought the cut grass scent and it didn't really smell like cut grass at all. So we were a little dissapointed with that as well. It was a cool gift idea though and was well received with a nice little chuckle. Unlit candles had strong scent (especially Coffee) but minimal to no scent when burning. Coffee and Dirt scents were most true to life, but Cut Grass and Sawdust were less like real thing (and least appealing), in my opinion. Would recommend just for the novelty, and for the appealing scent of unlit Coffee candle (it permeates the room). I purchased the "Fresh Cut Grass" and "Sawdust" candles for myself. I'm a 24 y/o engineer living in an average sized 2 bedroom apartment. Using the candles in my small (compared to a house) living room, they struggle to fill the room with the least bit of scent. If I walk up to them and put my nose close, they smell great! I just wish that smell actually diffused (at least) throughout the room that I use them in, let alone my whole aparmtment. You all got as close to making a candle smell like grass and sawdust as possible, now just make them more potent!!! If you do, let me know and I'll definitely buy more! It makes sense these funky smells were the brainchild of a teenager. This one was given to a teen boy who likes candles. He loved the campfire smell. Makes me think the house is on fire, so gotta remind myself it's just the candle. My younger brother has been obsessed with the smell of coffee since he was a toddler, so much so that he kept a bowl of coffee beans under his bed to "make the room smell nice" I included this coffee mancandle in his 13th birthday package to which his ecstatic response was WhooHoo! Its the best smelling candle ever! and promptly instagramed it. Have not given my son this for a gift, was all banged up and not in any good shape to give to anyone. I have have to find and buy him something else. Hart Main collaborates with local chandlers to craft soy-wax-blend candles that possess the kinds of familiar aromas that any man (or woman) can appreciate.